Joel Politi’s 13 ½-length Ellis Park Debutante winner Serengeti Empress leads a field of 12 2-year-old fillies that were entered to compete in Saturday’s 50th running of the $200,000 Pocahontas (Grade II) at Churchill Downs, one of four stakes races scheduled at the Louisville track on the first Saturday of its 11-day September Meet and an event with implications for both next spring’s 145th running of the Longines Kentucky Oaks (GI) and the upcoming $2 million Breeders’ Cup Juvenile Fillies (GI). The Pocahontas will be the last of 11 races on the Saturday racing program and has a scheduled post time of 5:57 p.m. (all times Eastern). The 1 1/16-mile race opens the “Road to the Kentucky Oaks” points system that will determine the field of 14 for America’s premier race for 3-year-old fillies next spring. The Pocahontas offers Kentucky Oaks points on a scale of 10-4-2-1 to its top four finishers. The Pocahontas also is a Breeders’ Cup “Win and You’re In” Challenge race for the Breeders’ Cup Juvenile Fillies, which will be run Friday, Nov. 2 at Churchill Downs. The Pocahontas winner will earn an automatic berth in the starting gate for the 1 1/16-mile race for 2-year-old fillies, along with $60,000 in starting fees and a travel stipend. Trained by Tom Amoss, Serengeti Empress (3-2-0-0—$71,310) controlled every step of the Ellis Park Debutante with Corey Lanerie aboard. The 2-year-old Alternation filly has won two of the first three starts of her career with her only hiccup coming in the July 20 Schuylerville (GIII) at Saratoga. “I’m really excited about her,” Amoss said. 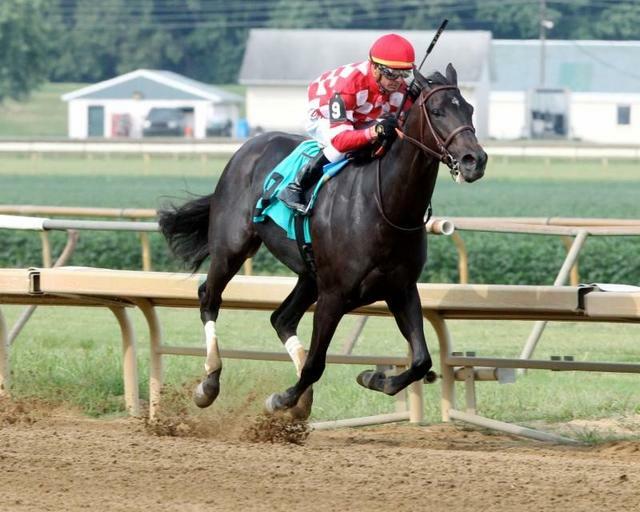 “We came back quickly to run in the Schuylerville after breaking her maiden in her first start. It was one of those races that everything went wrong. Serengeti Empress will be ridden once again by Lanerie and break from the rail. Among Serengeti Empress’ top competition is ERJ Racing and Dave Kenney’s standout maiden winner Splashy Kisses for California-based trainer Doug O’Neill. The daughter of Blame, who was a $100,000 purchase at the 2018 Fasig Tipton March Sale, won in her second start on Aug. 18 at Del Mar by 5 ¾ lengths under Joel Rosario. Splashy Kisses (2-1-0-0—$36,345) arrived at Churchill Downs on Tuesday and drew post position five with Drayden Van Dyke scheduled to ride. Also entered in the Pocahontas are New York-invaders Two Dozen Roses (2-1-0-0—$47,388) and It Justhitthe Wire (1-0-0-1—$10,200). The duo exits a six-furlong maiden special weight at Saratoga where It Justhitthe Wire, trained by Kiaran McLaughlin, defeated Two Dozen Roses, trained by Todd Pletcher, by a neck but was disqualified and placed third because of interference in the stretch. Ricardo Santana Jr. picks up the mount on Two Dozen Roses and breaks from post position eight while It Justhitthe Wire breaks one spot to the outside in post nine with Joe Rocco Jr. aboard. The field for the Pocahontas, in order of post position (with jockey, trainer and assigned weight): Serengeti Empress (Lanerie, Amoss, 120 pounds); Love My Honey (Julien Leparoux, Mike Maker, 118); My Wynter Rose (Cory Orm, Tommy Short, 118); Profound Legacy (Brian Hernandez Jr., Ian Wilkes, 118); Splashy Kisses (Drayden Van Dyke, Doug O’Neill, 118); Lightscameraaction (Robby Albarado, Kenny McPeek, 118); Include Edition (James Graham, Vickie Foley, 118); Two Dozen Roses (Santana, Pletcher, 118); It Justhitthe Wire (Rocco, McLaughlin, 118); Taylors Spirit (Shaun Bridgmohan, Scott Gelner, 120); Saved At Dawn (Fernando De La Cruz, Brad Cox, 118); and Tapping Pearl (Florent Geroux, Mark Casse, 118).